Thanks to the super short time taken to complete the annealing, using induction heaters in production would result in productivity boost and cost savings. 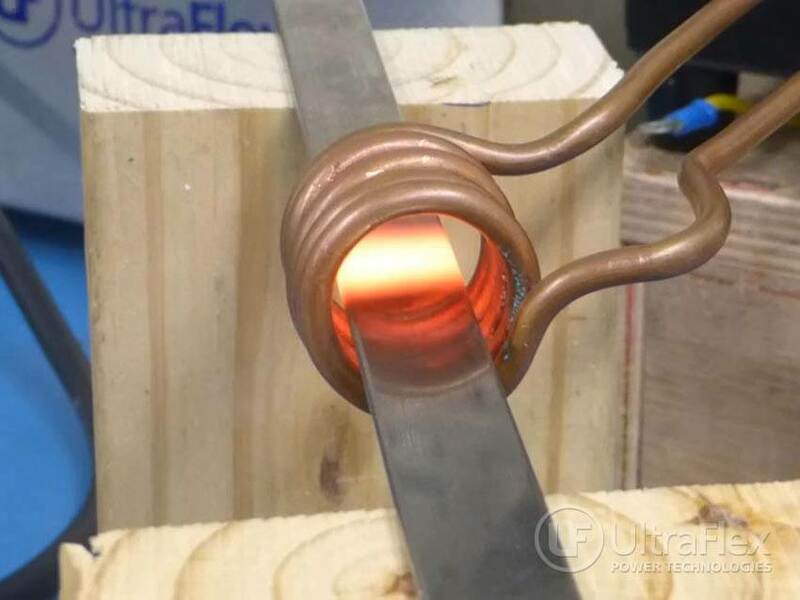 [Mar 20th, 2019] A recent test set up by UltraFlex Power Technologies showed that annealing two rectangular stainless steel piano wires using induction heating could be achieved in as little as 1 second. UltraFlex – a leading provider of advanced, digitally controlled induction heaters – used a 5 kW compact induction system from their proprietary UltraHeat SM series to heat the wires in this test scenario. UltraHeat SM induction heaters operate with either water-cooled or air-cooled remote heat station. They are easy to tune to a variety of loads and coils and supply power from 1 to 100% in 1% increments. To clock the time needed to anneal different piano wires, 2 test setups had been done: the first one used a 0.04″(1.01mm) thick wire, with 0.25″(6.35mm) width and 3.5″(88.9mm) length. In the second test setup, the wire had been twice thicker (0.08’’ / 2.03mm), with a width of 0.6’’ (15.24mm) and length of 1” (25.4mm). The annealing process required heating temperature of 1300°F (704°C). For the thinner wire, at 100% power output for the 5 kW induction heater it took as little as 1 second to reach the target temperature and complete the annealing process. The annealing of the thicker wire required only 5 seconds, at power output of 4.76 kW. Following the successful tests, the company’s engineers confirmed that UltraFlex SM induction heaters can meet the heating rate requirements for this and larger stainless steel piano wires. Thanks to the super short time taken to complete the annealing process, using induction heaters on the production line would result in significant productivity boost and energy costs reduction. With induction heating, it’s not uncommon to be able to convert 90% of your energy into heat in the part and heating times are generally reduced by up to 50%.